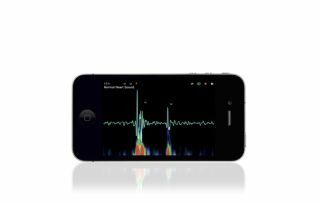 A device resembling an iPhone illustrates one of many possible designs for a medical scanner sought by the $10 million Qualcomm Tricorder X Prize. Handheld "Star Trek" technology capable of instantly diagnosing people's medical conditions need not wait until the 23rd century to become a reality. The X Prize Foundation teamed up with wireless-technology giant Qualcomm to officially announce a new $10 million prize for anyone who can create the 21st century version of the futuristic device. The $10 million Qualcomm Tricorder X Prize — named after Star Trek's medical tricorder — looks to find a winning device capable of collecting key health information about individual patients and diagnosing a set of 15 diseases. The prize announcement at the 2012 Consumer Electronics Show (CES) in Las Vegas emphasized technologies that could put the state of a person's health into the palm of his or her hands. "The Qualcomm Tricorder X PRIZE will incent the creation of technologies that can empower the consumer with the ability to decide when, where and how to seek health information and care," said Peter Diamandis, chairman and CEO of the X Prize Foundation. Winning technologies must not only diagnose the set of 15 diseases across 30 different people in three days, but also provide a "compelling consumer experience" while recording health data such as blood pressure, breathing rate and temperature. The tricorder devices can take any number of shapes as long as they do not weigh more than five lbs., according to the contest rules. That means they could include sensors attached to a phone-style control unit, or even have separate sensors fastened to different parts of the user's body. Such devices might not even have a display screen if pure audio proves enough to report medical results. Teams can compete for a $7 million first place prize, $2 million second place prize and $1 million third place prize over the next three-and-a-half years. The futuristic device envisioned by the X Prize has already crept closer than many people may realize —research labs have begun turning consumer devices such as Apple's iPhone into basic medical imaging devices. That makes the medical tricorder less of a geek fantasy and more of a possible reality, even if medical treatment remains stuck in the 21st century. "Health care today certainly falls far short of the vision portrayed in 'Star Trek,'" said Paul Jacobs, chairman and CEO of Qualcomm.